Lead guitar extraordinaire Eddie Angel has a side project band that is much more rockabilly than Los Straitjackets. They are mostly a vocal act, but do a considerable number of top notch instros, some of which they share with Los Straitjackets' live set. 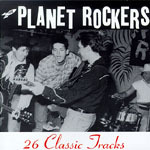 This CD collects a goboon of their tracks, including 5 solid instro rockers. Cool vibrato laden bison bop with ample twang. The melody line is minimal, like "Moon Dawg" or "Raw Hide," but the bridge and break are totally cool. Sounds like the Bobby Fuller number, rhythmic and thundering, but not melodic. Powerful delivery and energetic as well. Rockabilly instromania, B-side ecstasy and shredding glissandoes, coupled with dissonant destructo collisions. A real raver! Chiyo and the Crescents ancient obscuro rechanneled into a more rockabilly version than Los Straitjackets do. Cool performance there, Eddie! Hens teeth to you all! Raw live energetic barnyard tom foolery!